The Hounds of Avalon are coming… For these are the twilight days, when eternal winter falls and the gods destroy themselves in civil war … when an invasion force of ghastly power threatens to eradicate all life. Humanity’s last chance lies with two friends, as different as night and day, but bound together by an awesome destiny. Hunter: a warrior, a rake, an assassin; Hal: a lowly records clerk in a Government office. They must pierce a mystery surrounding the myths of King Arthur to find the dreaming hero who will ride out of the mists of legend to save the world. But time is running out. For when the Hounds of Avalon appear, all hope is lost… Hounds of Avalon is the latest installment in Mark Chadbourn’s brilliant new sequence: exciting, evocative, terrifying and awe-inspiring. 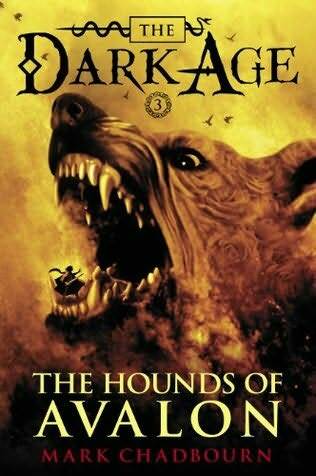 Last Wednesday I finished this book, the third in Mark Chadbourn’s The Dark Age trilogy. It took me a while to come to terms with what I’d read. It’s a continuation of the first two books, of course. I am going to be a bit spoilery here, it’s not that big a deal as far as the plot goes, I don’t think. Anyway, you get to revisit some friends from the Age of Misrule Trilogy. So that was kind of cool! Last night I finished the second Dark Age book by Mark Chadbourn, The Queen of Sinister. A new Dark Age has fallen across Britain; gods and monsters walk the land. In this new time, myth and legend has become realtity; nothing is quite as it seems. The plague came without warning. Nothing could stop its progress: not medicines, not prayer. The first sign of the disease is black spots at the base of the fingers; an agonising death quickly follows. But this is no ordinary disease … Caitlin Shepherd, a lowly GP, is allowed to cross the veil into the mystical Celtic Otherworld in search of a cure; her search takes her on a quest to the end of a land of dreams and nightmares to petition the gods. Caitlin is humanity’s last hope, but she carries a terrible burden: a consciousness shattered into five distinct personalities … and one of them may not be human. The Queen of Sinister is the second installment in Mark Chadbourn’s riveting ‘Dark Age’ sequence: a masterful blend of Celtic myth and Arthurian legend in a modern setting. Ok, first off, I mentioned in my last post that I was a bit disgruntled about Mallory’s secret. Well, according to one line in this book, I was supposed to be! I’m glad to hear it! Now that I know I didn’t miss something, I’m quite a lot happier about things. 😉 And as a quick follow up, I can’t think of a single time in this novel when there was a weird POV change! Yay for editing! This novel, as mentioned in the blurb, is about Caitlin. (I don’t think it’s too much of a spoiler to mention she’s another Sister of Dragons.) She and a sometimes not-so-merry band of travellers cross over into Otherworld to try and save humans from a plague. There’s treachery, horrible monsters, vast emotions, and finally sacrifice and redemption. It takes until the very last pages of this novel for things to work themselves out. It was very fast moving, and I can’t wait to see what happens in the next novel! I’m trying to work out just now how Chadbourn will be able to finish everything up in one more novel! We still don’t even know who two of the five dragon champions will be yet, nevertheless how they’re all going to meet and save the day! Check back for the review of book 3, The Hounds of Avalon. I got to finish the first book in The Dark Age trilogy by Mark Chadbourn, The Devil in Green, while I was on vacation. The Dark Age is a continuation of the story set out in Chadbourn’s Age of Misrule trilogy. Humanity has emerged, blinking, from the Age of Misrule into a world substantially changed: cities lie devastated, communications are limited, anarchy rages across the land. Society has been thrown into a new Dark Age where superstition holds sway. The Tuatha De Danaan roam the land once more, their terrible powers dwarfing anything mortals have to offer. And in their wake come all the creatures of myth and legend, no longer confined to the shadows. As I mentioned in my last post, I never reviewed any of the Age of Misrule books here, so I will make a few comments about it first. I loved the first few chapters that were excerpted at Pyr. But it seemed to me as Chadbourn added more characters that he wasn’t very good at indicating a change in POV. There were many, many times in AoM where I’d have to reread passages, sometimes in the middle of a paragraph!, to figure out who the heck I was trying to read about. This was very disappointing to me as the story was very interesting (almost interesting enough to get me to reread the series, as I just returned from vacation in England in May, and it would be very interesting to go back and see which places I visited), and the characters not too stereotyped, at least not all of them. Also, in the end, my favorite character turned out to be the inadvertent bad guy which didn’t sit well either. 😉 Hopefully that won’t be a spoiler for anything except who my favorite character ended up being! As it happens, I think Mr. Chadbourn has improved greatly with this book! I can think of only about four times in The Devil in Green where the POV change was confusing and in each of those times it was only for a one sentence paragraph, after which the POV switched back to the character that was being read before. So, yay! A good story gets to read much more quickly and easily! Again the overarching story sounds like it will be about 5 Brothers and Sisters of Dragons that will gather together to save the world. (It’s actually a bit more complicated than that, but I don’t want to spoil things!) The Devil in Green was about two of those and how they met and came to learn that they were a Brother and Sister of Dragons. There’s great character growth and some happy endings in this essentially post-apocalyptic setting, so that’s always nice (for me). I am a little frustrated with one thing in this book. The main main (nope, not a typo) character, Mallory, has a secret which is sort of revealed toward the end of the book and I just don’t get it. Perhaps someone can give me some insight on it, or can let me know if I’ll learn more in future books, ’cause I’m about halfway through the next book in the series, The Queen of Sinister, which so far is about a completely different Sister of Dragons, so I’m not seeing how there could be any clarification in this book. Check back for the Queen’s review! Today I read the first three chapters of Mark Chadbourn’s new Age of Misrule series. It’s ultimately intended to be three trilogies, but a big bonus is that the first three books will be out consecutively in April, May, and June. (I think. Amazon has their release dates as the end of May, June, and July, but you also seem to be able to buy the first one right now, so I’m hoping the first info is true.) In any case, this article from Tor about the book covers is what led me to the link above. And I wouldn’t even have looked at the Tor post if the first book cover wasn’t so pretty (the thumbnails don’t do them justice)! 😉 I just wish now that they were coming out in hardcover rather than trade paperback. In any case, I hope to see if the first book, World’s End, is in my local B&N after work on Monday!